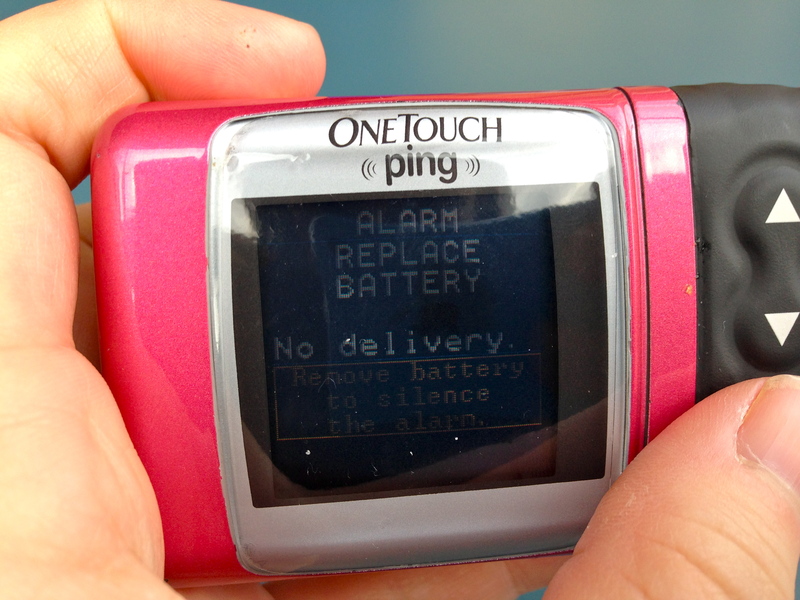 Diabetes Tech Fail. Life Win. 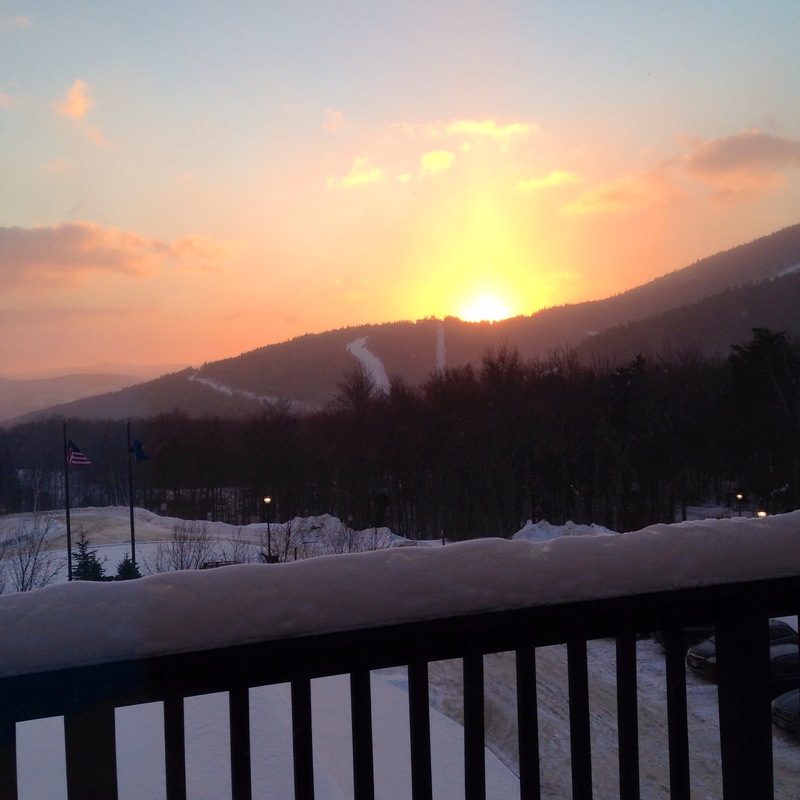 I awoke on Saturday morning with a beautiful view. I grabbed my Dexcom before heading out onto the mountain and saw an hourglass. I thought it’s accuracy was declining, but I wanted to make it last through the weekend. Out on the mountain, I received a “sensor failed” notification. I restarted it (even though I didn’t have a meter with me), but within a half hour had gotten the message again. I was skiing blind. My friend and I had decided we needed to get a full day’s worth of skiing in, hitting all of the trails we haven’t been able to do. 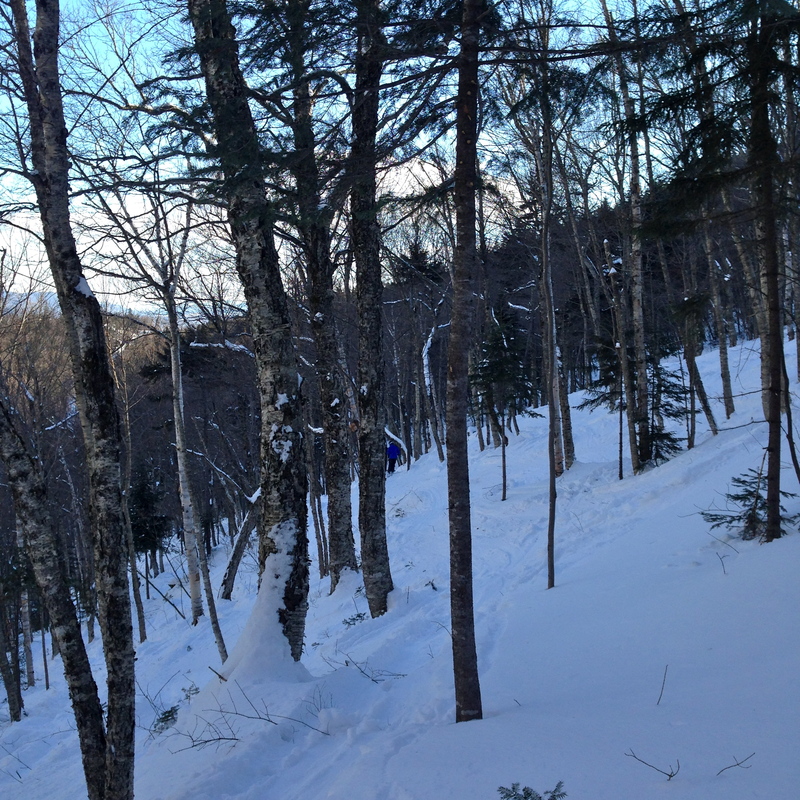 We hit the steeps and the trees and met up with the rest of our family. I fueled up and bolused, even though I was nervous not knowing where I was sitting or what direction I was headed. I knew I’d find out at lunch. 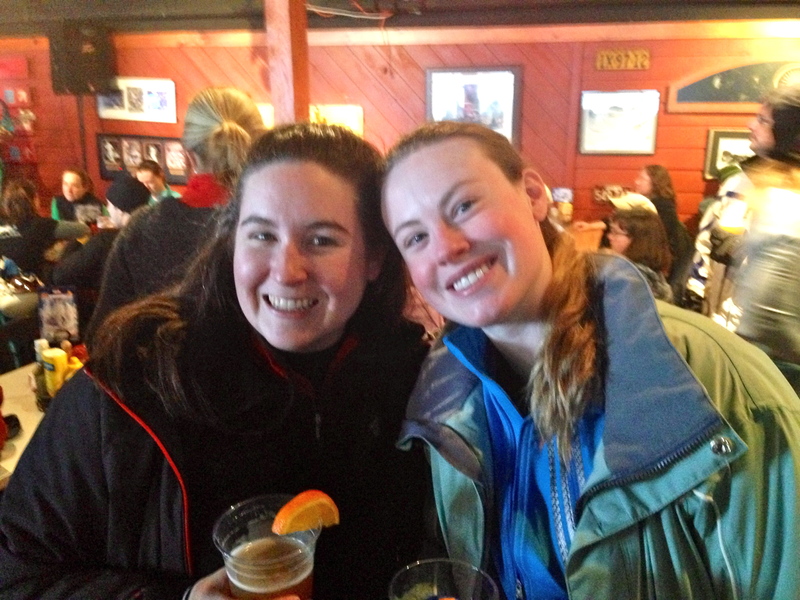 We kept skiing and skiing and agreeing we were cold and were going to take a break. The fact that the only chairlift we could take to get back to the hotel was on windhold didn’t cross my mind. Lunch came and went without another BG number. 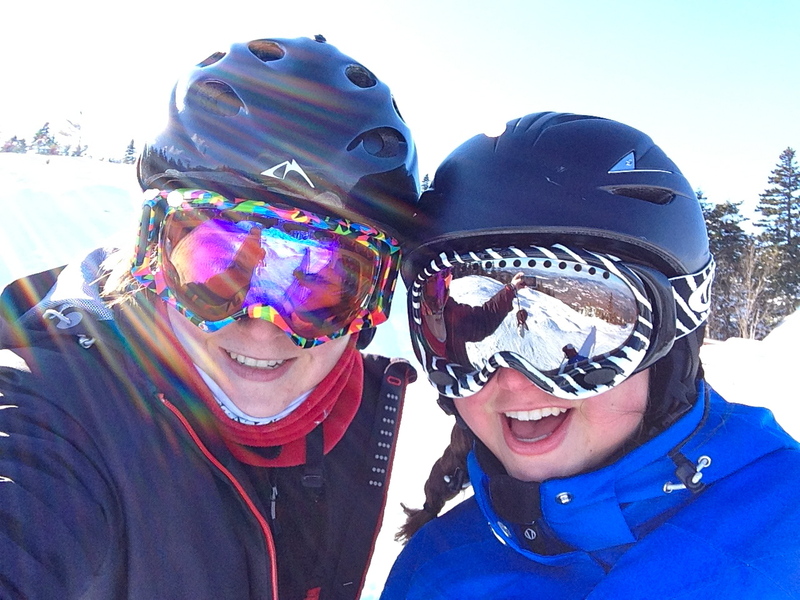 I felt good though, so again I bolused blindly and kept on skiing. And skiing and skiing and skiing and skiing. After a drink, and getting a really sweet Bud Light promo shirt, we made it to the shuttle to get back to the hotel. I took out my meter and tested and I have no idea what it was. This is what I call a good moment. If the number had been memorable, I’m sure it would not have been in range. We relaxed, and napped, and showered and ate, and then downstairs. My cousin wanted us to do shots that night, but I kept saying no. 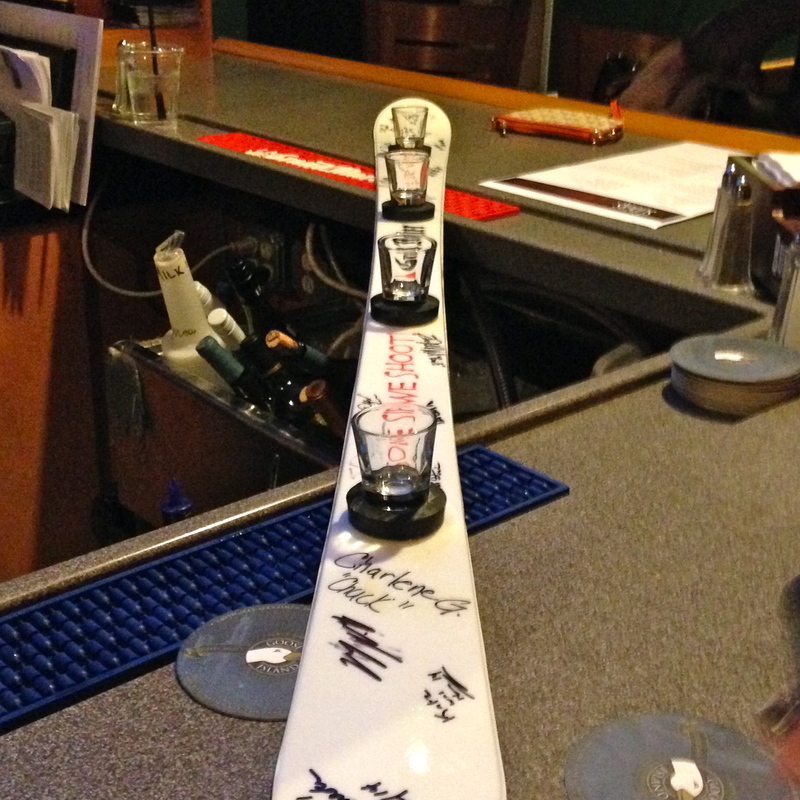 The bartender asked if we wanted to do the shotski and I couldn’t pass it up. Going to sleep after a night at the bar (not a crazy night, but still a night at the bar) makes me nervous without a Dex. When I woke up in the morning, I was in a great place to start the day. We got out onto the mountain as quickly as possible on Sunday morning. We knew the wind had quit, the sun was shining and we had a shorter day. It was cold out, and I forgot my tummie tote, so I wrapped my pump in a fuzzy sock and put it in my jacket. I felt it buzzing in my pocket all of a sudden and checked to see what it was saying. The battery was dead. Funny, since I looked at it that morning and it was full. I knew that it was going to be cold, and I knew that we would stop for a snacks at a lodge. I try not to indulge in snacks all the time, but planned it for Sunday. This means I had a smaller breakfast. Listening to my pump scream at me meant I couldn’t eat anything. I grabbed a coffee to get something in my body, but I was starving. I sat there surrounded by people eating everything I wanted. Tears were forming in the corners of my eyes. The thing that really pissed me off is that it kept buzzing and singing and wailing telling me it couldn’t deliver insulin because it was dead. WELL HOW COME YOU CAN SCREAM AT ME, BUT NOT DELIVER INSULIN?! This is a legitimate question and if anyone knows where I can find this information, please point me in that direction. I did a few more of my favorite trails and then I went back to the hotel. I didn’t want to go any longer without insulin, and OMG FOOD! When I got back I put a new battery in, and I was good to go, and only 170. Diabetes technology only failed this weekend, and yet, I loved every minute of the weekend and wish it didn’t have to end as quickly as it did. All I can say in congratulations. Way to go!